QUIKRETE® Shotcrete MS – Fiber Reinforced to restore the Galveston Island Historic Pleasure Pier in Galveston, Texas. 1,800 Care Packages Delivered to Shelters, Group Homes and Churches Across New Jersey. Weirs Improve Water Flow to Reclaim Natural Geology and Landscape. Fireplace Strength and Aesthetics Important Factors in Annual Maintenance. The George W. Bush Presidential Center Constructed with Leading Masonry Products. Avoid Costly Repairs Caused by Cold Temperatures and Precipitation. The QUIKRETE® Companies kicks off its fourth season supporting the hometown Atlanta Falcons with the QUIKRETE® QUIKCASH program. The American Shotcrete Association Recognizes Oregon Tunnel Project. Most Viewed Home Improvement Projects Focus on Building. The winners each received a copy of the QUIKRETE® Guide to Concrete book and up to $599 in QUIKRETE® products to help build a patio, BBQ fire pit, walkway or outdoor kitchen. The QUIKRETE® Companies will be demonstrating the strength of its anchoring epoxies during a series of in-booth demonstrations scheduled throughout the World of Concrete. Installing concrete and brick pavers or natural stone can add curb appeal or increase a home’s outdoor living space in patios and walkways. QUIKRETE® Fireplace Mortar is a silicate-based refractory cement caulk ideal for tuck pointing damaged firebox mortar joints and repairing chips, cracks and breaks in fire brick commonly found in fireplaces and wood burning stoves. Stucco provides an attractive and durable cement-based coating and is frequently applied to masonry and properly prepared wooden, gypsum wallboard and expanded polystyrene insulation board surfaces. QUIKRETE® Veneer Stone Mortars are Portland cement and hydrated lime-based, contractor grade mortars ideal for veneer applications and tuck-pointing manufactured or natural stone. QUIKRETE® Fireplace Mortar is a silicate-based refractory cement caulk ideal for tuck pointing damaged firebox mortar joints, chips, cracks and spalls commonly found in fireplaces and wood burning stoves. You can transform ordinary concrete into inviting living spaces with the multi-colored appearance of natural stone. The QUIKRETE® Companies today announced its acquisition of Target Products, Ltd., the leading producer of dry mix concrete and cement related products in Western Canada. Countertops Made with Concrete Offer a Stylish, Cost-Saving Surface Alternative. The QUIKRETE® Companies today announced the acquisition of Gibraltar National Corporation in Detroit, Mich., a licensed manufacturer of packaged concrete, bulk mortar and grout. QUIKRETE® Fast-Setting Concrete Provides Long-Lasting Durability. Will Manufacture Concrete Made with Recycled Materials. Many variables come together to produce high-quality masonry. The QUIKRETE® Companies to Demonstrate Products Before Braves/Red Sox Game on June 17. Additive to Protect Rebar and Prevent Oxidation During Full and/or Partial Depth Repairs. 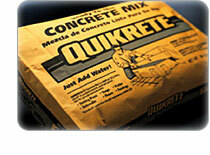 QUIKRETE® Concrete Resurfacer Repairs and Strengthens Concrete Surfaces. New Veneer Stone Mortar Formulated to Improve Jobsite Installation, Reduce Callbacks. Restore Garage Floors with the QUIKRETE® Epoxy Garage Floor Coating Kit. The QUIKRETE® Companies will showcase its versatile line of commercial products at the 2006 World of Concrete in Las Vegas, Nev., from Jan. 17 to Jan. 20. The QUIKRETE® Companies will showcase its versatile line of interior and exterior home products for professional contractors and home builders at the 2006 International Builders’ Show in Orlando, Fla., from Jan. 11 to Jan. 14.